The Central City Opera House was built by Welsh and Cornish miners. It cost $32,000 to construct. Some of the opera house's original 1878 chairs hang from the ceiling in the Williams Stable House across the street. In one of the opera house's dressing rooms, Central City Opera director of marketing Lisa Zetah looks at photos of some of the opera's past performers. With 550 seats, the Central City Opera House is the only jewel-box opera house in North America, said Eric Chinn, the opera's director of historic properties. Next door to the opera house, the historic Teller House has been everything from a hotel to a casino to a restaurant. Kara Tinucci runs JKQ BBQ in the historic Teller House. But more than 140 years later, the opera house still doesn't have a functional heating system. Without that, it's only usable for about eight weeks a year during the summer. Getting heat in the opera house is the first step to not only better utilizing the venue Zetah calls the "jewel of Central City," but to reinvigorating the town. In 1878, the Central City Opera House opened its doors for the first time. It was a labor of love for the town's Welsh and Cornish miners who had come to the community in search of fortune, and it quickly became the heart of the community, said Eric Chinn, director of historic properties for the opera association. The organization owns 30 historic properties in the town, including the opera house. The Central City Opera House was designed by Denver architect Robert Roeschlaub. For the first four years of its existence, the Central City Opera House was the place for everything, Chinn said. Theater, musical acts — Buffalo Bill and P.T. Barnum's circus even performed there. 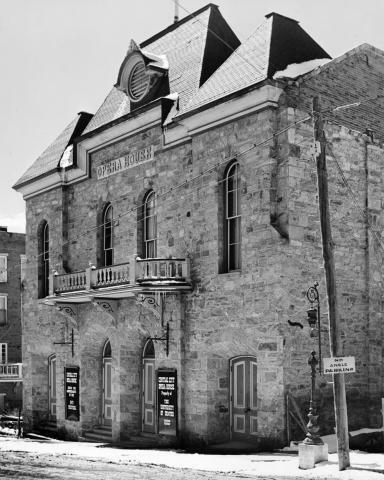 Then, Horace Tabor built his Tabor Grand Opera House in Denver and the Tabor Opera House in Leadville, stealing a lot of Central City's thunder. To stay afloat, the venue had to adjust. It became a meeting house for local civic and church groups. Later on, it was a movie theater. For a brief time, the opera house even hosted kangaroo boxing. "That's like a cartoon, you know, like where a boxer is fighting the kangaroo," Chinn said, shaking his head at the imagery. "But it actually happened here." Alas, even boxing kangaroos weren't enough and the opera house shut down in 1927. Potential plans for the site included a garage and at one point, the opera house was even used to house cattle, Chinn said. But in 1931, Denver cultural advocate Anne Evans and educator Ida Kruse McFarlane decided to return the opera house to its former glory, creating the Central City Opera House Association. The opera house reopened with the 1932 premiere of "Camille," featuring Broadway legend Robert Edmond in the director's chair and silent-screen star Lillian Gish in the lead role. The event was broadcast on NBC radio. Old film footage shows attendees arriving on horse-drawn carriages and in period costumes for the event. The opera house was back, along with big names like Myrna Loy and Mae West. After that, no more cows or boxing kangaroos, Zetah said. The opera house stayed an opera house. Then in 1991, another competitor came to Central City. Gambling was legalized in mountain towns and officials in both Central City and neighboring Black Hawk jumped on the potential cash cow. As newly-elected Central City Mayor Jeremy Fey put it, "When gaming came in in the early '90s, it pushed all other businesses out. Every single commercial building in Central City became a casino." For a while anyway. Then Black Hawk decided to go all-in, creating a Vegas-style atmosphere, Fey said. And just like with Horace Tabor in the 1800s, Central City couldn't compete. Casinos shut down, some owners simply locked the doors and walked away. Gambling is still a big part of the town's economy — 85 percent of Central City's revenue comes from the casinos, he said. But the candy stores, souvenir shops and photographers who would take old-fashioned western pictures of families? Most of those didn't come back. Five years ago, Fey was looking for a location to create a combined hospitality and arts residency space. His brother Tyler, who runs their late father Barry Fey 's concert production company, Feyline, invited him up to a show he was promoting in an empty casino. "I came up to look and saw the vacancy rates up here and was shocked by them," he said. "We're 45 minutes from the core of Denver, but yet 75 percent of Central City was vacant." "The arts have always been a mainstay in Central City." Technically, the numbers are closer to 55 percent, Fey said. But that only accounts for the ground floors of buildings. Add second and third stories and the number rises considerably, he said. That's why Fey thinks now is the perfect time for the arts to make a comeback. Just don't call it a "comeback." "The arts have always been a mainstay in Central City," Fey said, noting the town's long history with the Gilpin County Arts Association — the longest running arts association in the state — and renowned Denver painter Vance Kirkland. Both Fey and the opera association envision a renewed arts focus for the town in the next five to 10 years that includes an arts academy and residencies for artists. Also, despite the opera house's historic appeal and great acoustics, a 550-seat venue can be tough to make profitable, Fey said. Which is why he hopes to add two more venues to the landscape — a 1,600- and 3,600-seater. With that, there also needs to be more hotels, a grocery store and freestanding restaurants, he said. Currently there's only one restaurant in the town that's not part of a casino. Formerly from Las Vegas, Kara Tinucci and her husband, Joseph, have been in the food and casino business for the past decade. Seven years ago, the couple moved to Central City so Joseph could work at a nearby casino and Tinucci could start JKQ BBQ restaurant. Their contract at the Teller House — which is right next door to the opera house — is for September through May, but Kara Tinucci said they do OK despite only being in business during the town's "off season." "Business has been really good for us," Tinucci said. "We came in with pretty realistic expectations and the business has exceeded those expectations, so we're thrilled." That said, she said she'd love the chance to expand her business, and having more of a draw to the town besides the casinos would help in lots of ways. "The residents don't want just casinos, they want more to do," Tinucci said. "And of course visitors, they want to do other things. They may have one family member that doesn't want to go to the casinos and the city needs to offer more things for them to do." That's why, Central City Opera spokeswoman Lisa Zetah said, town officials and the opera association are working together. Last summer, they brought back a rebooted version of the town's Central Jazz Fest and started a new plein air painting festival. The association is even working with Dory Vanderhoof, an arts consultant who helped Aspen expand its public profile from its ski town roots into a world-class arts community in the 1970s. "Really our goal is to engage audiences — the pillar is Central City Opera — but then also to bring in other forms of art within the community so that it becomes more than just the summer festival that we have here," Zetah said. Standing on the opera house's empty stage, watching her breath in the freezing cold opera house, Zetah said she can almost see it, just like the history of this beloved venue. "I can just feel all of this energy around all of what's happened in the past, and everybody that's performed here," she said. "I don't know, there's just a — I don't even know how to explain it — there's an essence about this place that not many have."